What do you imagine it is necessary at an event ? It is a SOUND, isn't it ? During the "Ningen Shogi", a member of the group who preserve one of traditional drums in Tendo drum "Oushou Daiko". 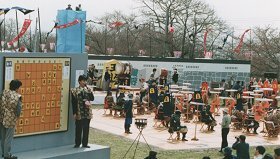 They drum many variety of sound which is different from each shogi pieces. It is easy to know which piece is moved when you hear that sound. 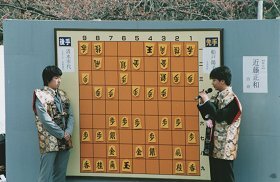 Next to the very large shogi board, other professional shogi players explain that game on the large shogi board. There are many femail samurai at the event. 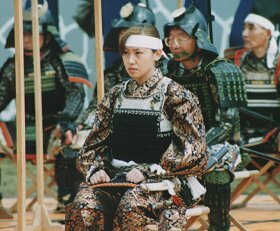 Woman of a right picture performed a shogi piece "Fuhyou" (same as pawn of chess) is a geisha in Tendo spa same as koshimoto who serve Japanese sake for tourists. So other women without a shogi piece "Fuhyou" are ordinary persons. # geisha : a professional female entertainer trained in traditional dance and music.